Businesses that rely on recurring revenue require strong unit economics to grow. Businesses that rely on recurring revenue require strong unit economics to grow. Notable SaaS VC David Skok defines as an LTV:CAC ratio of 3:1 or higher — but what does this mean exactly, and how do you achieve it? 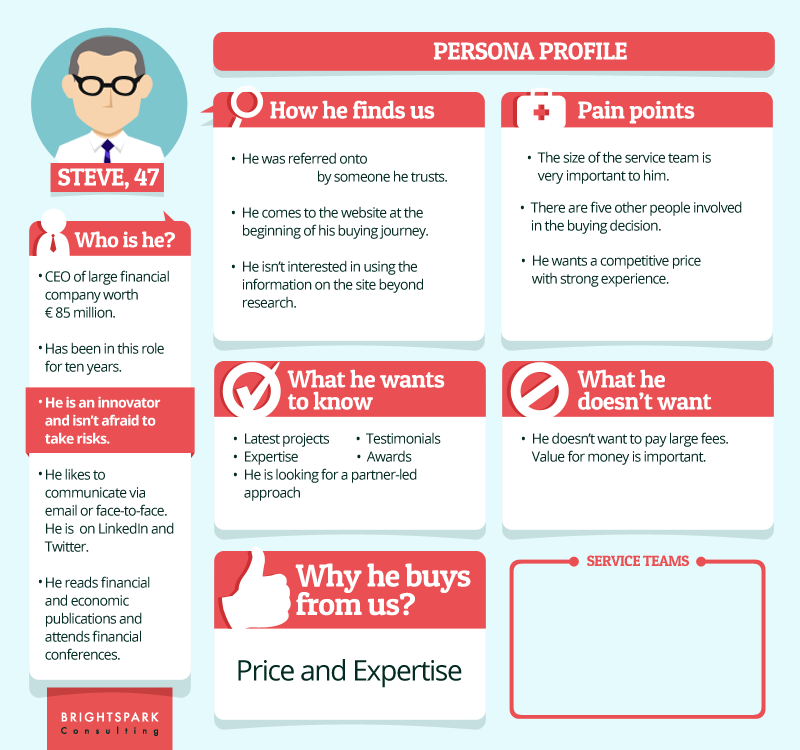 The example below will give you an idea of what a quantified target persona looks like. 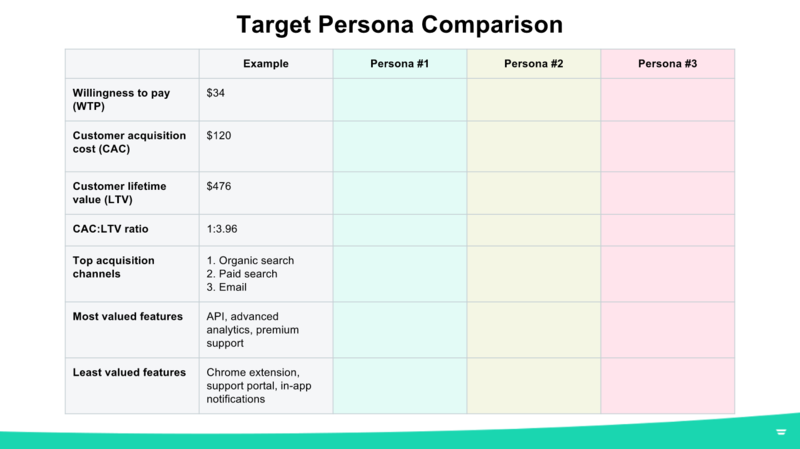 Read on to learn how to accurately quantify your target personas. What is this buyer willing to pay? Willingness to pay (WTP) refers to the dollar amount your customers are willing to pay for your product. How do you collect this information? Most people can’t tell you how much they’re willing to spend, which is why we recommend using Van Westendorp’s Price Sensitivity Meter. Van Westendorp’s Price Sensitivity Meter is more effective than alternatives (like price laddering), because it defines an accurate price range. 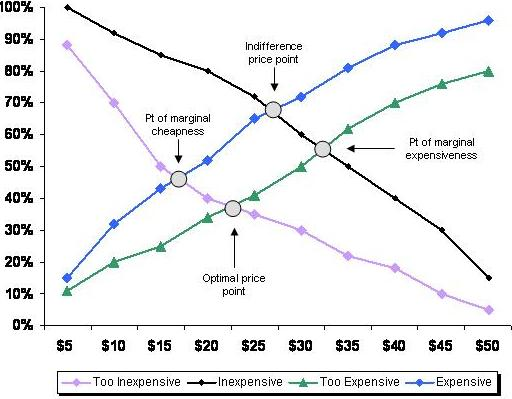 "The first two questions force respondents to anchor themselves to an acceptable price range and the last two questions help narrow the optimal price band. Once a statistically significant number of people respond to these questions, you can graph the responses and determine an optimal price band and a more specific optimal price point. You’ll want to collect this data on a segment-by-segment basis. That way you can design plans that include the core features each segment wants, at a price point that’s optimal for each segment. What is the average lifetime value of this buyer? Customer lifetime value (LTV) refers to the total revenue you collect over the customer’s lifetime. To calculate your customer lifetime value, you’ll first need to determine the average value of a sale (e.g. $44) and the average number of repeat transactions over time (e.g. 12 transactions per year for 2.33 years). Once you’ve collected this data, simply multiply the numbers to determine your customer lifetime value (e.g. $44 x 12 x 2.33 = $1,230). Pro tip: Early-stage SaaS startups often don’t yet know the average lifetime of a customer. These companies can estimate their LTV using the inverse of their monthly churn rate, multiplied by their average monthly recurring revenue. For example, if a company is experiencing 3.5% monthly gross MRR churn, and customers are paying $85/mo, the LTV is (1/0.035) x 85 = $2,429. How much does it cost you to acquire this buyer? Customer acquisition cost (CAC) refers to the amount of money you spend to acquire a new buyer. Calculating your average customer acquisition cost is easy. Simply divide the number of customers you acquired during a specific period by the amount you spent on marketing and sales (including payroll). For example, if you spent $12,000 to acquire 100 customers in December, your customer acquisition cost would be $120. Unfortunately, this number can be misleading, which is why it’s important to break it down by segment. If you’re already tracking CAC at the account level, pull a list and then segment it by customer type to determine your average CAC on a per segment basis. You’re likely to discover that one segment is more costly to acquire than the other, which may or may not indicate it’s time to reevaluate your acquisition channel strategy. What features matter to this buyer? Ask buyers what features matter to them when speaking to them 1:1. Members of your sales and success teams do this regularly, so that should be your first stop. After collecting insights from them, get on the phone with a few customers from each segment and ask them directly. Create a survey designed to reveal preferred features. Use Likert scales to determine how important each feature is. Then, ask your buyers to rank the features in order of preference to discover relative importance. Be sure to send your survey to enough customers to achieve statistical significance.